Nothing sells a perfume (at every price point, for nearly any demographic) like the promise of romance, right? 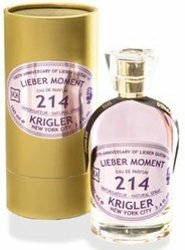 The prestige brand Krigler, which emphasizes its five generations of luxury perfumery, recently released Lieber Moment 214, a "moment of love" designed to complement Lieber Gustav 14, "an early Krigler fragrance inspired by a love letter from WWI." I tried Lieber Gustav 14 a long time ago, and I liked it. It reminded me of Caron Pour Un Homme, since it's a masculine lavender-vanilla-musk blend that can also worn by a woman with certain tastes. Lieber Moment 214 is described as "smoother and more powdery" than Lieber Gustav 14, and its composition includes notes of grapefruit, aldehydes, lavender, violet, rose, ylang ylang, white musk, vanilla and patchouli. Although Lieber Moment, like Lieber Gustav, is "created to suit both men and women," I find it intensely feminine and I can't imagine it finding a male audience. Of course, I happen to enjoy many feminine aldehydic florals, and Lieber Moment is another one to add to my list. Its kinship with Lieber Gustav is most apparent in its earlier stages, when it blooms with a slightly musky lavender note. The body of the fragrance is mostly powdery violet and rose, and the base is a soft vanilla-musk with the barest hint of woods. The dry down lacks...something. I'm not sure what, exactly; it just feels somewhat anemic, and it fades away without making a concluding statement. If' you (like me!) are fanatical about violet-rose floral fragrances and you're curious for a comparison, I'd say it falls about midway between Frédéric Malle Lipstick Rose and Yves Saint Laurent Paris on this very specific spectrum, so if you love either of those, you may like this one. Like many aldehydic florals, Lieber Moment has plenty of sillage: when I accidentally tipped out more of my sample vial than I'd planned, the scent seemed to rise from my arm in shimmery waves. Its lasting power is average for an Eau de Parfum — for this price, I think, it should last longer. Lastly, although Lieber Moment is billed as "nostalgic" and "sentimental," it doesn't truly smell like a vintage fragrance. If you're in the mood for olfactory time-travel to the World War I era, I'd recommend Guerlain L'Heure Bleue (1912) and Caron N'Aimez Que Moi (1916), even in their current formulations. But if you're just looking for a powdery-aldehydic rose-violet perfume, and you can afford to go high-end, you might want to sample Lieber Moment. Krigler Lieber Moment 214 is available as 50 ml ($205) and 100 ml ($305) Eau de Parfum. For purchasing information, see the Krigler website. Unpopular opinion alert: My favorite aldehydic rose violet is Broadway Nite. Another one that doesn’t get talked about much is To Dream from Sonoma Scent Studio. Have you tried it? Ha hah, I love Broadway Nite!! Some of those earlier Bonds were wonderful, weren’t they? I usually save Broadway Night for festive occasions and evenings, and it needs to be applied with a light hand, but — gorgeous stuff. I do love To Dream! I *think* I reviewed it a while back. I think I preferred Lieu de Reves *slightly*… but I liked both very much! SSS has a really distinctive touch with florals. Yay, a fellow fan! So often when I mention it people hide their eyes. Like you, I save it for night and evenings out because it’s so… bombastic? I agree. I seem to remember you reviewed Nostalgie too? Also pretty pretty with aldehydes. Love that her aldehydic fragrances aren’t too sweet. I LOVE To Dream, so much so that before my sample ran out, I went to order it and found out Laurie was on a break. Thank goodness someone had posted on NST that one could send an email to Laurie to place an order and she accommodated! To Dream is in my Top 10 Desert Island Perfumes. It really is a beautiful fragrance. Wear Broadway Nite all the time!!!! Love it !!!! Maurice Roucel may be my favourite “nose”. M Roucel is one of the greats!! YAY! He is one of my very favorites too. Love Envy and L especially. My first Krigler encounter was via Sniffapalooza in May. I was suitably impressed with the salesperson who was very patient despite being mobbed. My favorite was Subtle Orchid 10 and I promptly ordered samples although they are currently missing in action. My second encounter was 3 weeks ago with TWO (not a mob in my book) perfume friends. The salesperson (a different one) insisted there were just too many of us, we should have made an appointment and we are limited to try 5 perfumes (not 5 each but 5 to be shared between the 3 of us). I did a slow twirl to see if there were any other customers within 20 feet of the stall and did not spot anyone. When she continued to insist that we must make an appointment, I asked for her name and her manager’s name. She immediately recanted and started to whip out bottle after bottle and recited the notes – a robot could not have done better! The irony of all that drama was I ended up liking Subtle Orchid 10 all over again. Hm! I wouldn’t think that a trio of friends would be too many customers to handle at once… especially since you were obviously very interested in being there. Odd! Wonder what was going on.